Topics: Short Breaks, Winter Warmer Break, Around Britain Break, Bargain Break, and Remember When Break. It is hosted by Fasthosts Internet Limited - Uk S Largest Web Hosting Company (England, Gloucester,) using Microsoft-IIS/6 web server. Its 3 nameservers are ns3.livedns.co.uk, ns1.livedns.co.uk, and ns2.livedns.co.uk. 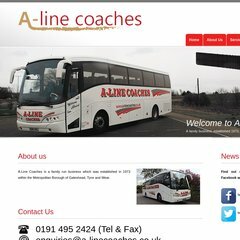 A-linecoaches.co.uk's server IP number is 213.171.219.247. PING www. (213.171.219.247) 56(84) bytes of data.